There are many good economic reasons to have multi-generational (at least 3 generations) households. There are some good social reasons too. There can be interpersonal benefits but also annoyances (which I think is why they decreased – plus we could afford it, the USA was living extremely richly). Another factor has been the big wave of immigration, dominated by Latin Americans and Asians, that began around 1970. Like their European counterparts from earlier centuries, these modern immigrants are far more inclined than native-born Americans to live in multi-generational family households. However, the trend reversal has also played out among native-born Americans. And for all groups, the move into multi-generational family households has accelerated during the Great Recession that began at the end of 2007. The percentage of the population in such households now is 16%, still significantly below the high of 24.7% in 1940. The global economy continue to be fragile and chaotic. At the same time companies continue to make large, and often increasing, profit. Here are some good blog posts on investing, personal finance and the economy. I believe in weak stock market efficiency. And recently the market is making me think it is weaker than I believed :-/ I believe that the market does a decent job of factoring in news and conditions but that the “wisdom of crowds” is far from perfect. There are plenty of valuing weaknesses that can lead to inefficient pricing and opportunities for gain. The simplest of those are spotted and then adopted by enough money that they become efficient and don’t allow significant gains. And a big problem for investors is that while I think there are plenty of inefficiencies to take advantage of finding them and investing successfully is quite hard. And so most that try do not succeed (do not get a return that justifies their time and risk – overall trying to take advantage of inefficiencies is likely to be more risky). Some Inefficiencies however seem to persist and allow low risk gains – such as investing in boring undervalued stocks. Read Ben Graham’s books for great investing ideas. There is also what seems like an increase in manipulation in the market. While it is bad that large organizations can manipulate the market they provide opportunities to those that step in after prices reflect manipulation (rather than efficient markets). It is seriously annoying when regulators allow manipulators to retroactively get out of bad trades (like when there was that huge flash crash and those engaging in high frequency “trading” front-running an manipulation in reality but not called that because it is illegal). Those that were smart enough to buy stocks those high frequency traders sold should have been able to profit from their smart decision. I definitely support a very small transaction tax for investment trades – it would raise revenue and serve reduce non-value added high frequency trading (which just seems to allow a few speculators to siphon of market gains through front running). I am fine with speculation within bounds – I don’t like markets where more than half of the trades are speculators instead of investors. The national credit card delinquency rate (the rate of borrowers 90 or more days past due) decreased for the sixth consecutive quarter, dropping to 0.6% at the end of the second quarter in 2011. This is the lowest mark observed in 17 years. Credit card debt per borrower increased $20 in the quarter to $4,699, though it remains near record-low levels (and yet still at a level that is far too high). Although credit card delinquencies were expected to drop, the data released today shows credit card delinquency rates improving by more than at any other time since the recovery began in 2009, both on a quarter-over-quarter basis (-18.9%) and on a year-over-year basis (-34.8%). The record low-level of credit card debt that has continued post recession is supported by a separate TransUnion credit card deleveraging analysis released in July. The analysis found that consumers made an estimated $72 billion more in payments on their credit cards than purchases between the first quarters of 2009 and 2010. This is good news. We still need to reduce pay off much more of the excessive debt we took on living beyond our means the last few decades, but at least this is a small positive step. Overall consumer debt increased in the 2nd quarter, according to the Federal Reserve, and stands at over $2.45 Trillion. Revolving debt (credit cards) decreased slightly but non-revolving debt increased more. Consumer debt peaked near $2.55 Trillion in 2009 and recently bottomed just below around $2.4 in 2010. Consumer debt totals still need a great deal of improvement. The current frustration with economic conditions in the USA and Europe has at its core two main elements. First the anti-capitalist concentration of power in a few monopolistic and oligopolistic corporations (along with the support and encouragement of governments and the governments failure to regulate markets to encourage capitalist practices). And second the consequences of living beyond our means finally becoming much more challenging. What we have had has been very questionably capitalist. The largest reason for this “questionable” nature is not related to labor but instead to the inordinate power given to a limited number of large corporations. The corporations are suppose to not have “market power” in real capitalism. They have huge and growing market power. To me the main problem is that power disruption to the functioning of capitalist free markets. There is also the problem that we have been living far beyond our means. This has nothing to do with capitalism or not capitalism. It is as simple as you produce 100 units of goods and use 110 that can’t continue forever. The USA started building a surplus in the 1940’s, I imagine Europe did in the 1950’s. Since about the 1980’s both areas have been living far beyond their means. While they were consuming what they saved over the previous decades it wasn’t so bad. While they mortgaged their future to live lavishly today that was worse. We continue to live beyond our means and are beginning to see some consequences but we haven’t come close to accepting the lavish lifestyles we enjoyed (while Europe and the USA lived off past gains and off very advantageous trade with the rest of the world) is not possible any longer. We can’t just have everyone in Europe and the USA live exceeding well and the rest of the world support us. Eventually we have to realize this (or in any event we will experience it, even if we don’t realize it). Those 2 factors need to be addressed for our economic future to be as bright as it should be. The fundamental truth right now is that the overall economy in Europe, the USA and Japan is weak and has some serious long term problems. But the connection between that and company weakness is not incredibly strong. Many companies have huge cash hoards, built up through the large profits they continue to make. Yes, the economy entering a serious downturn will hurt many companies. A railroad is going to lose some sales if retail sales decline (and so they don’t have to be shipped). Airlines (historically problematic companies to begin will) will struggle. Banks that pay exorbitant amounts to senior staff have trouble making money without handouts of taking huge risks that then result in more handouts once the risks fail (as usually a bad economy will expose the risks they have taken). Companies that can only do well based on large top line growth will suffer. But that isn’t all companies. When you look at companies like Google, Apple, Tesco, Danaher, Amazon even Toyota I really don’t see many problems looking forward. They seem perfectly capable of staying profitable, even growing profits, even in the face of economic decline in Europe, the USA and Japan (if that happens: it is possible, but not certain – very low growth is possible). Companies that have very good prospects at staying profitable, even getting more profitable going forward are hardly the type of investment I want to sell. Especially not to put it in the bank and get 0%, or a money market fund and pay someone for the privilege of having my money. The options for investing today don’t look so great. But I really don’t see any reason to be concerned about owning stocks that have good prospects to do well even if the quite a few large economies do poorly in the next decade. In fact I am happy to own them. Frankly the biggest worry I have is that the senior executives will loot the owners profits with exorbitant pay (this is not a worry at Toyota and less of one at Amazon). I would worry more about owning index funds in such an environment. But even as bad as things look now, I am not sure they will really turn out as bad as we fear – especially for many companies, for some yes, but many are well prepared for change). And the prospects in emerging markets look incredibly good to me. Yes they will slow their growth a bit if the large economies stall, but I think it is foolish to avoid investments in China, Singapore, Brazil, Korea, India, Ghana, Malaysia, Indonesia. In fact that is where companies like Google, Tesco, Apple, Toyota and Amazon are going to be making lots of money. Emerging markets are volatile and the companies in them are too. This will continue. The report on employment released today was not good news but it was less bad than feared. Total nonfarm payroll employment rose by 117,000 in July, and the unemployment rate was little changed at 9.1%, the United States Bureau of Labor Statistics reported today. Employment growth in July, follows little growth over the prior 2 months. Total private employment rose by 154,000 over the month. Sectors experiencing growth include: health care, retail trade, manufacturing, and mining. Government employment continued to trend down. Some good news is found in the adjustments to the last two months job numbers. The change in total nonfarm payroll employment for May was revised from +25,000 to +53,000, and the change for June was revised from +18,000 to +46,000. That adds 56,000 jobs to the 117,000 jobs added in July and brings to the total for this report to 173,000 additional jobs. Still not great but much better than the last 2 months. The economy needs to add 125,000 a month to keep up with population growth. And currently the economy needs to add much more to make up for all the jobs lost due to the too big to fail institution created credit crisis. The damage done to the economy by those institutions and continuing to be done in order to support those companies remains enormous. I believe we need to see 230,000 jobs added a month consistently (in order to be making ground up for the damage done), before we can believe we are doing well. Remember it was just over 2 years ago we were losing hundreds of thousands of jobs a month. We are doing much better now, but fixing how broken things were is not easy. Between January of 2008 and February of 2010, the economy lost 8.75 million jobs. Since February 2010, 1.94 million jobs have been added. That means we have still lost 6,810,000 jobs and when you consider we have to add 125,000 a month to keep up we have 43 * 125,000 = 5,375,000 we haven’t added bringing a the total of jobs needed to over 12,000,000 (the number we need to add to get back to where we were). But truthfully we probably were at a bubble induced level at the peak so 12,000,000 is probably an overestimate of how many jobs we need to gain back. Welcome to the Curious Cat Investing and Economics Carnival: find useful recent personal finance, investing and economics blog posts and articles. If you want to have an post considered for the next carnival please submit it to quixperito: money. 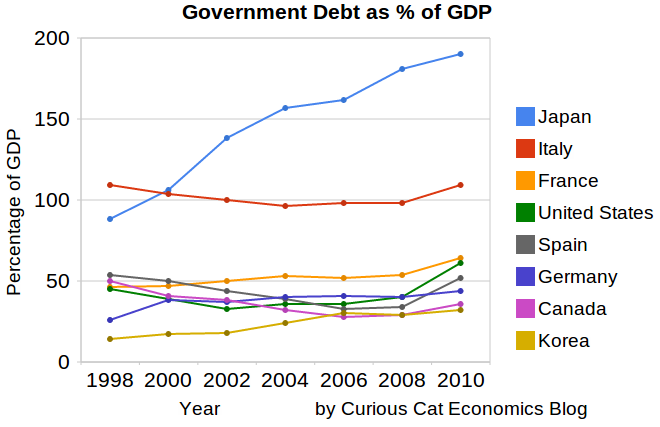 Government Debt as Percent of GDP 1998-2010 for OECD countries by John Hunter – There has been a dramatic increase from 2008-2010. The USA is up from 41% of GDP to 61%. Spain is up from 34% to 52% (but given all the concern with Spain this doesn’t seem to indicate the real debt problems they have. Economic data contains quite of bit of noise, unfortunately.